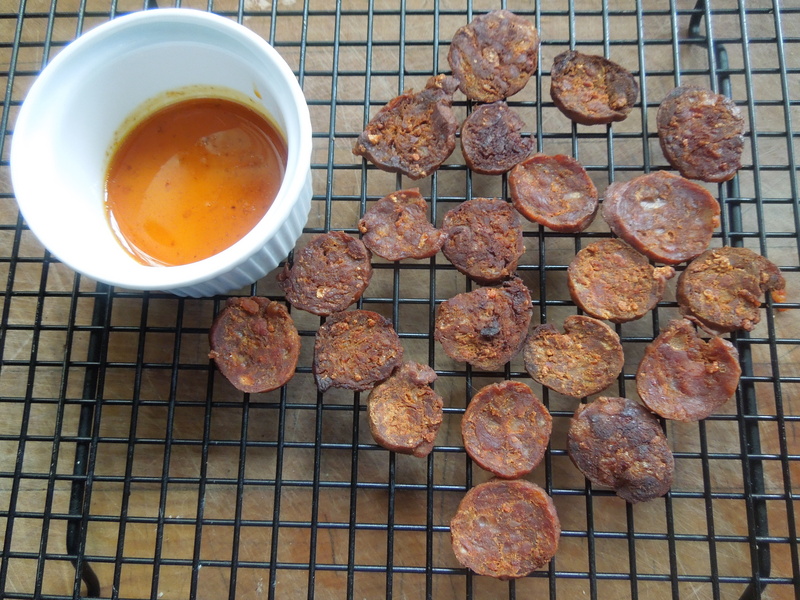 Chorizo crisps are something I discovered recently and I think they’re probably mildly addictive. Easy to make, they are a fantastic addition to this main course summer salad. It’s something you can throw together very quickly, with the delicate smoked chicken given a spicy kick by the crunchy chorizo and unctuous harissa mayonnaise. 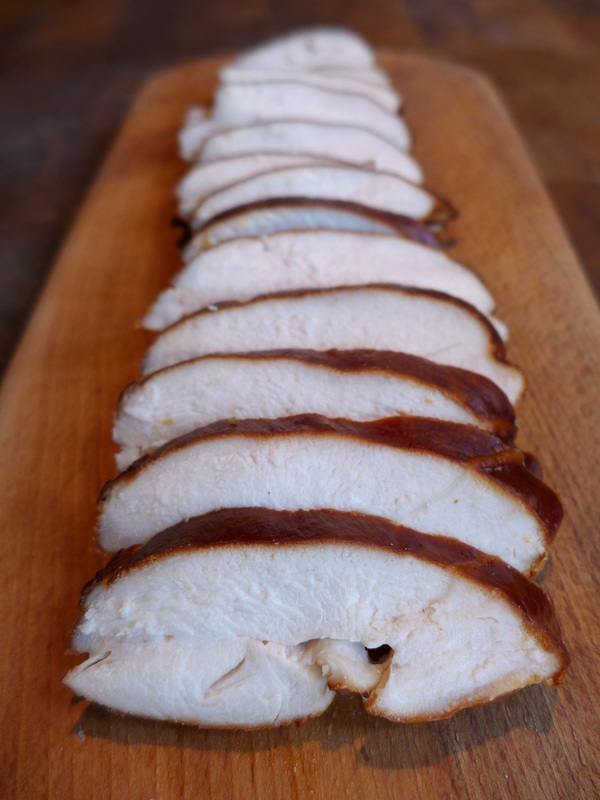 If you’d like to smoke your own chicken, follow the instructions here. If you don’t have a box or stove-top hot smoker, you can make one using a cheap wok, lined with a double layer of tin foil. Just throw a handful of hardwood chips in the base, put the cured chicken on a rack, clamp on a lid and smoke over a low flame for 20 minutes (best best done out of doors). 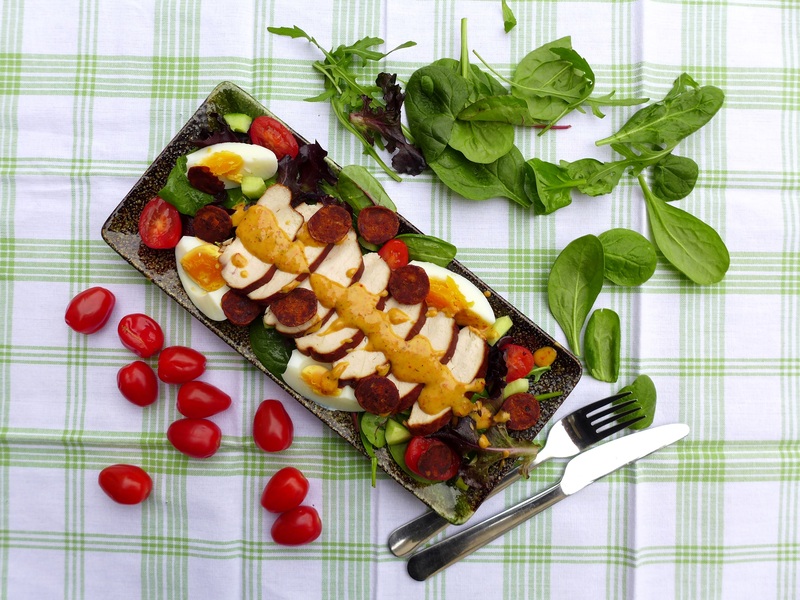 Don’t skip the eggs when prepping the salad, they add a bland creaminess that offsets the other ingredients beautifully and please be cautious about adding extra salt, as the chorizo and chicken are quite salty in themselves. 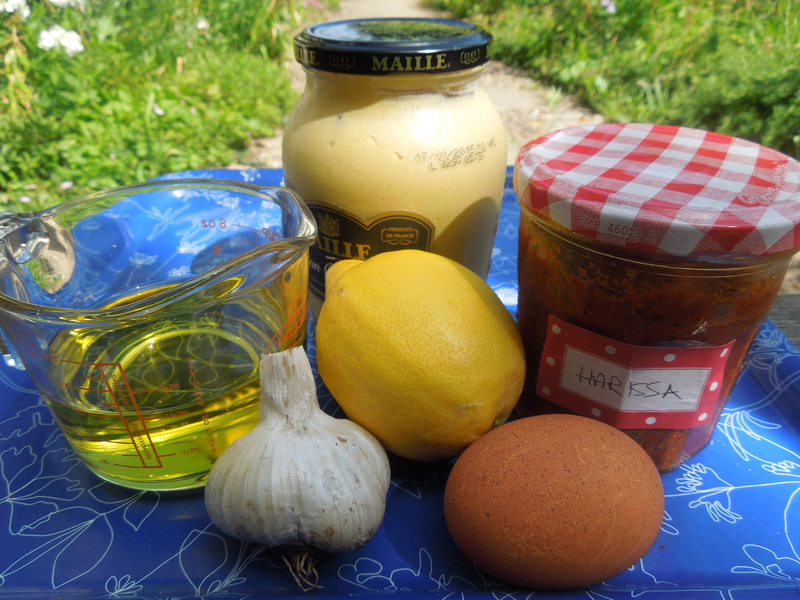 For two people, just halve the quantities, as I have in the pictures. You can’t really make a smaller quantity of mayonnaise but any leftovers will keep in the fridge, covered with cling film, for a couple of days. To make the mayo, first make sure all the ingredients are at room temperature. Then, using a bowl big enough to hold the finished mayo (this will make 150 ml), crush the garlic with a pinch of sea salt until you have a paste. Add half the lemon juice, the mustard, egg yolk and a grind of black pepper and blend with a small wire whisk or a fork. Put the bowl on a folded tea towel so it doesn’t slide around. Put the oil in a jug and add it to the bowl a few drips at a time, whisking well. When it begins to thicken, hold the jug high and pour in the oil in a thin, steady stream, whisking all the time. You should end up with a thick emulsion. This method always works for me but if you are unlucky and it splits, put another egg yolk in a new bowl and add the first mix a drip at a time as before. Add the remaining lemon juice and the hot water to thin it a little. Then add a little more hot water until it has a consistency you can drizzle over the finished dish – it should not be too runny. 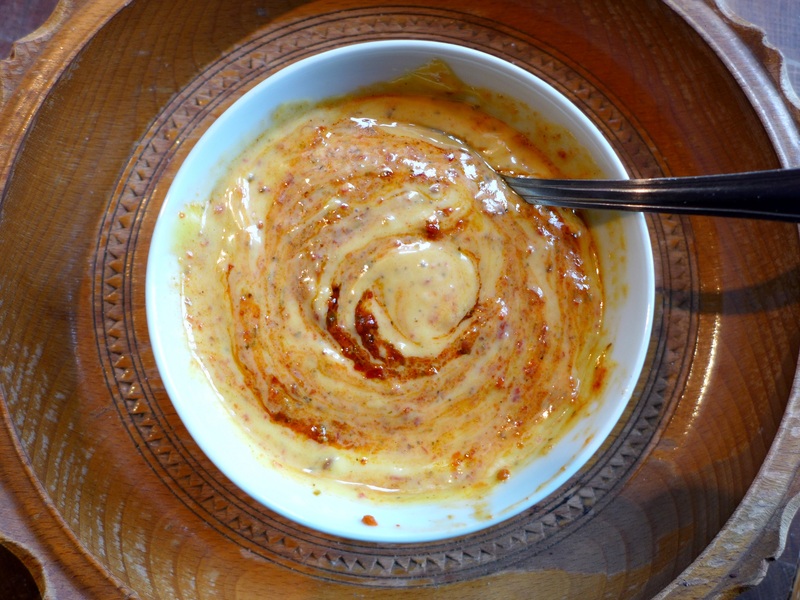 Once you’ve made the basic mayonnaise, stir in a teaspoon or two of harissa, to taste. Set aside in the fridge, covered in cling film. Boil the eggs for around 7-8 minutes then run cold water over them to cool. Peel and set aside in the fridge. Skin the chorizo, slice it thinly, then fry it in a hot dry pan for a minute or two each side until crisp but not burned. Reserve the oil that runs off, blot the chorizo on kitchen paper and leave to cool on a wire rack. When you’re ready to eat, toss the salad leaves with a teaspoon or two of olive oil and a little lemon juice to lightly coat the leaves. Arrange them on a plate, slice the smoked chicken and lay it over the top, then add the halved hard-boiled eggs and the diced cucumber and tomato. Drizzle over some of the harissa mayo and scatter with the chorizo crisps and a few basil leaves. Dot a little chorizo oil around the edges of the plate. Eat and (I hope) enjoy. 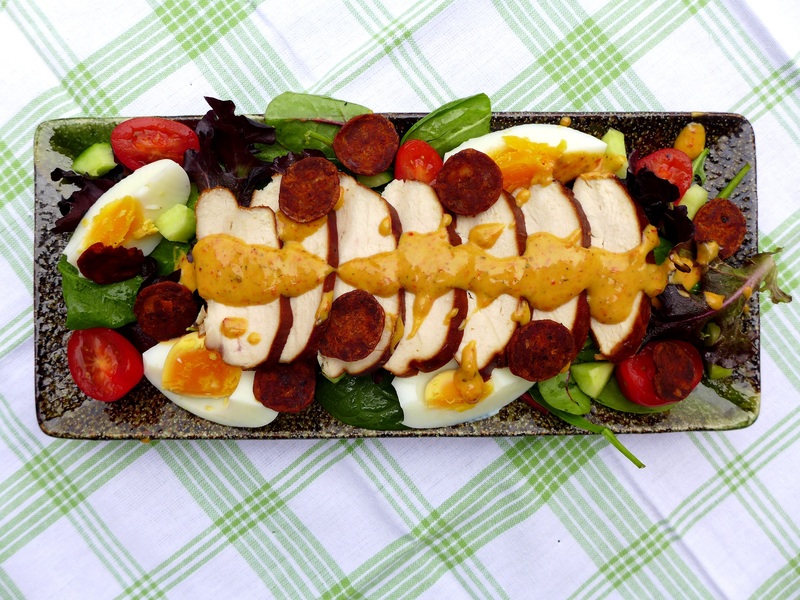 This entry was posted in Chicken and other poultry, Mains, Smoking and curing, Vegetables and salads and tagged chorizo crisps, harissa aioli, harissa mayonnaise, kickin' smoked chicken, smoked chicken salad by Linda Duffin. Bookmark the permalink. You have the eggs just perfect. Love the crisps. Will I find them in the health food aisle? I’m not sure I’ll ever be able to stop. I find them irresistible.